An Iowa State graduate student brings robotics into the classroom. John Haughery with his wife and son. While he was working in industry, John Haughery’s dream of teaching never quite went away. 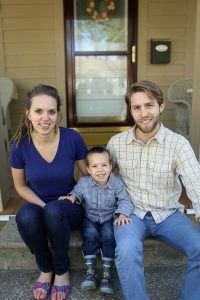 Before he knew it, he found himself quitting his job, selling his house and heading to Iowa State. Haughery, who is now a graduate student in agricultural and biological systems engineering, worked for Multi-Dimensional Integration, an industrial control system engineering and integration company where Haughery worked as a project engineer. The company was a great place for the native of Lancaster, Pennsylvania, to start his career after earning a degree in industrial control systems engineering technology from Millersville University. He says the position allowed him to gain valuable project management and technical design experience. Now, he’s ready to put those skills to work while also learning a few new things at ISU. “When I was searching for the right place to work on my Ph.D., Iowa State gave me a really good feeling. I had excellent conversations and interactions with faculty, especially with my major professor Dr. Raj Raman,” says Haughery. Iowa State also allowed him to teach as he pursued his doctorate, which was a big factor for Haughery. Keeping in line with his studies from his undergraduate, Haughery is continuing his work on manufacturing systems under the umbrella of ABE. Haughery’s research is centered on engineering education and how projects involving robotics can improve student motivate to engage with class content. Haughery is currently teaching Technology System Mangement 115, an introductory course, and he’s implementing some of his research into the classroom. Haughery has incorporated robotic projects in hopes that the outcome will result in a better prepared and engaged student. Instead of just giving them a dataset of numbers and problems to solve in Microsoft Excel and Visual Basic for Applications, students can engage with their project and see the effects of their coding in a hands-on way. While he was excited to change the course a bit, he was careful to stay in line with the departmental curriculum and keep the projects safe and ethical for students. The course itself is fairly structured. Haughery starts by teaching students the conceptual framework for the class such as how to solve a problem and basic statistical functions. Around midterms, the class transitions into an accelerated programming course where they learn how to program their robot. The last four weeks, which also represents the final project, the students pick an obstacle course and attempt to maneuver the robot through the course. In his freetime, Haughery enjoys spending time with his wife and four-year-old son.